All the lawn geeks seem to use a blend of Kentucky Bluegrass to get a great looking, dark green lawn. At least that's what it seems like when reading different lawn sites and forums. 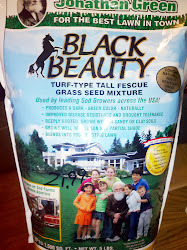 I decided to check out Jonathan Green's Black Beauty Turf-Type Tall Fescue grass seed mix because I've heard some good things about it. There are some people out there posting great lawn photos using other grass varieties besides KBG such as turf-type tall fescue (TTTF) and perennial ryegrass. I'm a bit weary of TTTF because there is some mixed into my lawn and it's thick bladed compared to my other grasses, grows faster and generally looks like a weed compared to my other grass. From what I'm hearing though the new varieties of TTTF aren't as coarse and wide bladed as the old varieties of tall fescue and they're hard to distinguish from KBG. The tall fescue I have in my lawn is an older variety and possibly the K-31 I see so many complaining about. Update: I was happy with how it looked so I wound up redoing my lawn and you can see pictures and info on my Black Beauty lawn. Nothing I've tried so far has really reduced the tall fescue in my lawn. I haven't applied a broad spectrum herbicide to it but overseeding with more KBG and pulling out a few clumps here and there hasn't done anything. When I get heavy rains and forget or don't have time to apply corn meal other parts of my lawn turn a little reddish brown except for the tall fescue. During the heat of summer when my finer bladed grass goes dormant if I don't water it enough, the tall fescue remains green and sticks out like a sore thumb being all green. That's when it dawned on me. Why fight it? The tall fescue wasn't always sticking out because it was bad, it was sticking out because it was good. It's also grows very dense and crowds out weeds. I don't know how well Black Beauty will do indoors so I'll likely move it outside at some point. What I'm really interested in with this little experiment is to see what the grass will finally look like. Hopefully it will grow enough that I can get a good feel for it before fall when I might do a lawn renovation. I literally mean feel. I want a grass that's nice to walk on barefoot. I don't imagine it will be as soft as shade type fine fescues but I'm hoping it will be good enough. The low maintenance and low water claims are really what appeal to me. Where I live we get sufficient rainfall and most people in my town don't have lawn sprinkler systems except for some commercial properties and a small percentage of new construction. A lawn probably only needs about 16 or so inches of supplemental water around here. If the Black Beauty can do better without supplemental water compared to KBG and I can reduce some watering that could be a decent savings. One often repeated rule of thumb is that lawns need 1" of water per week (not exactly but let's just use 1" for now). Based on that 1" of water turns out to be about 620 gallons of water per 1,000 sq ft of lawn. Multiplied by 12 is 9,920 gallons per 1,000 sq ft per year. That's about $80 per year per 1,000 sq ft and that's provided it's a year that I get at least average rainfall distributed fairly regularly, which doesn't always happen. That $80 is just for the water. My utility company charges me sewer fees based on water usage even if that water never goes down the drain. If you have a large lawn and don't get a lot of evenly spaced out rain watering your lawn would be hundreds of dollars a year. The dollar savings isn't huge but soil microbes are very important to an organic lawn and applying chlorinated city water will kill some of those beneficial bacteria and especially the beneficial fungi you've worked so hard to build up or in some cases payed good money to apply! Rainwater is much better for a lawn and if I can get a lawn that needs almost no supplemental irrigation I'd be very happy. This year I've basically let my lawn go dormant. Unfortunately weeds don't go dormant at the same time grass does which is why I'm seriously considering a renovation this year and trying to select the best grass seed. Anyway, back to Black Beauty... I picked up a 5lb bag at my local garden center so I can test it out. It was $21.99 regular price but it was on sale for $13.20. 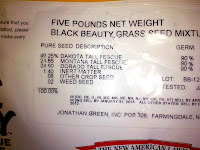 When it's not on sale it seems a little cheaper to buy a 15 lb bag of Jonathan Green Black Beauty Grass Seed Mix online. 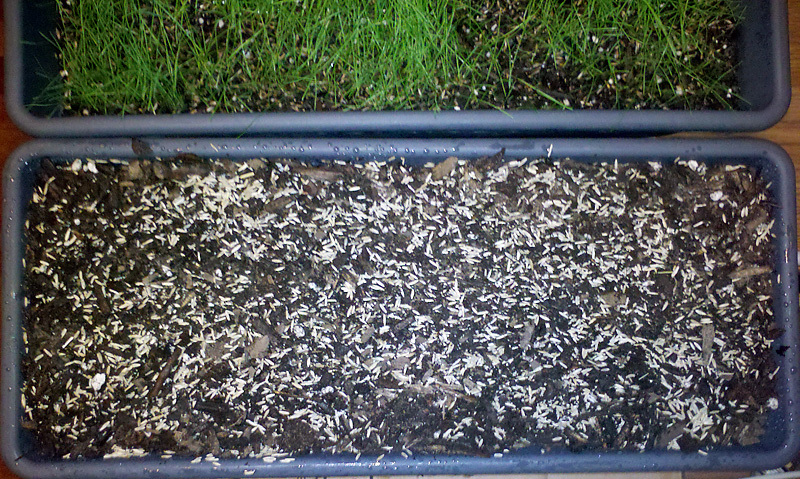 A 5lb bag will cover 1,500 sq ft when overseeding or 750 sq ft when seeding bare soil. A 15lb bag will cover 4,500 sq ft for overseeding 2,250 sq ft for seeding bare soil. The bag had a zip closing top which was nice since I'm only using about a handful of grass seed and will use the rest this fall if I like it. If I don't do a full lawn renovation I might wind up just overseeding it. Waxy coating helps preserve moisture and increase drought tolerance. Contains endophytes for natural insect resistance. If you haven't obsessed over grass seed for the past few years like I have here's something that might be useful. Grass comes in different grass varieties such as Kentucky Bluegrass, Fine Fescue, Tall Fescue, Turf-Type Tall Fescue, Perennial Ryegrass, Bermuda, St Augustine, Zoysia, etc. Within those varieties you have different grass cultivars which are different plants within that variety. Just like you have fruit, some of those are apple and a granny smith is a type of apple. Previous descriptions have listed Black Beauty's cultivars as 50% Dakota Tall Fescue, 25% Taos Tall Fescue and 25% Tombstone Tall Fescue. I don't know if the mix has changed globally or just in my area. I do remember reading that Black Beauty might have had some issues with disease and the change in the two cultivars might be related to that. I can't find any information on these varieties on NTEP.org which concerns me a bit. All I could find was this sheet about Black Beauty's drought ratings which contains NTEP data and says the tests were done on NTEP sites. According to that sheet Montana and Dorado perform significantly better than Taos and Tombstone and have a darker color. Montana Tall Fescue and Dorado Tall Fescue also had a much higher texture rating. This experiment I'm doing is all about texture. Ideally I'd plant this outside in the same soil I'd be planting my grass to see how it performs there but my main concern right now is how the grass will look and feel. The tech sheets are from Cascade International which is described as a sister company to Jonathan Green. Guessing here, but I think Cascade is the seed grower and possibly the supplier to sod farms while JG is more geared towards consumers when it comes to grass seed. There is 0.08% other crop seed which area other types of grasses not listed as the main cultivars. These can be unwanted and even weed type grasses. The weed seed content is 0.02% which consists of non grass weeds. Ideally you'd want 0% of each but from what I read anything less than 1% is fine so 0.1% of unwanted seed might not be too bad. I've seen a number of different photos of Black Beauty grass and they look really good. This is a close up photo of a piece of Black Beauty sod. The next photo was taken a year after laying the sod and the claim is that it hasn't been fertilized since. That's definitely a lawn I would be proud of! I've been stressing out over this decision for a long time. It's why I haven't done my lawn renovation in prior years. I spent a lot of time reviewing NTEP ratings for grass in my area, primarily for Kentucky Bluegrass but even though KBG lawns look so nice it seems they need a lot of care to look so good. When I'm lax in my lawn care it shows. Meanwhile I've seen lawns in my neighborhood that get very little attention and look decent. Those lawns appear to be tall fescue based on the blade length. I'm not great at identifying lawns. When the tall fescue in my lawn doesn't get enough water it stays green but gets a little stiffer, almost crunchy when you walk on it compared to the finer bladed grasses that have turned brown. 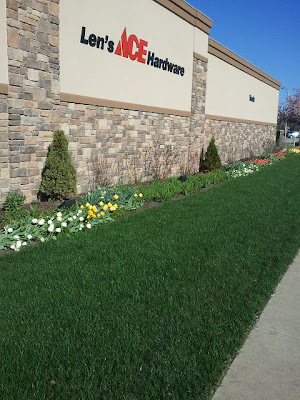 In my heart I want to have a custom blended elite KBG mix but even though I care about lawns enough to blog about them it's just a lawn and I don't want to spend too much time doing things to it. I've seen pictures of KBG lawns that stay green in drought while TTTF lawns have gone brown. I've also seen the opposite where TTTF lawns stayed green while KBG has gone brown. Both can have a nice dark green color if properly managed. TTTF is a clumping grass and KBG has rhizomes so it can fill in and repair itself while TTTF will need to be overseeded. Jonathan Green does make a Black Beauty Ultra which contains some KBG and some perennial rye so you can have a self repairing TTTF lawn. I went with the regular Black Beauty because I wanted to have one type of grass that would grow evenly. Right now I have some grasses that grow faster than others and it looks messy by the time I have to mow. They may have chosen cultivars that blend well together but right now I'm stressing out so much over KBG vs TTTF I don't even want to think about mixing the two. Black Beauty germinates in 10-14 days compared to up to 21 days for KBG. That's a somewhat important factor as I don't want to babysit seedlings and have to hand water multiple times a day to keep the seed moist. 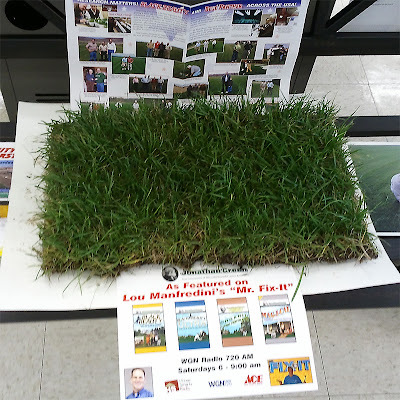 While the majority of lawn fanatics seem to favor Kentucky Bluegrass when planting cool season grasses, there are some TTTF and even PR diehards. "I like the Jonathan Green Black Beauty Mix," said Tukey. 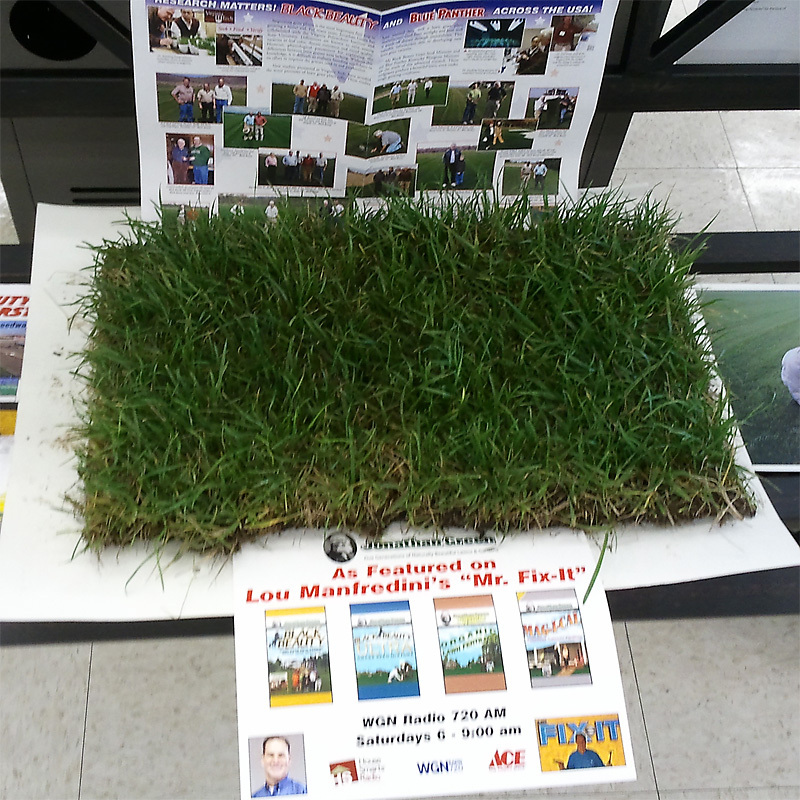 "Blue grass was originally imported as cattle feed because it's so fast growing. So if you want to mow your lawn every four days, go ahead and plant blue grass and knock yourself out." I'm still undecided and fall is fast approaching. I'm really hoping this experiment gives me some more perspective one way or the other. I think it's going to come down to less maintenance/water but slightly wider grass blades or more maintenance/water but finer blades. I think maintenance/water will win out. I followed the same procedure as I did for my other container grass. Some of it can bee seen in the top of the photos. 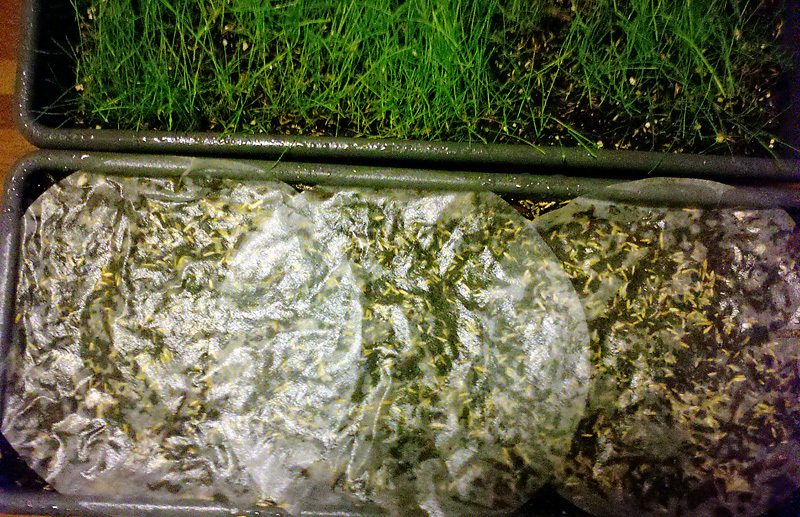 I think I had poor germination because I used an old bag of seed. This new bag was bought today. Filled a well draining planter about 1/4" from the top with organic potting mix. I filled it up more this time because after watering a couple of days the mix compressed a bit and sank too far below the top than I would have liked. 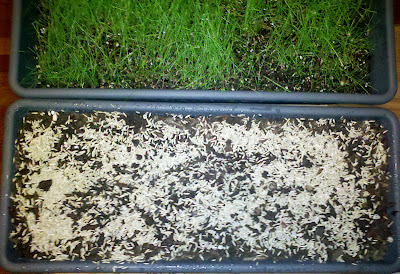 Evenly spread a handful of Jonathan Green Black Beauty grass seed over the top. This was a much heavier application than necessary. 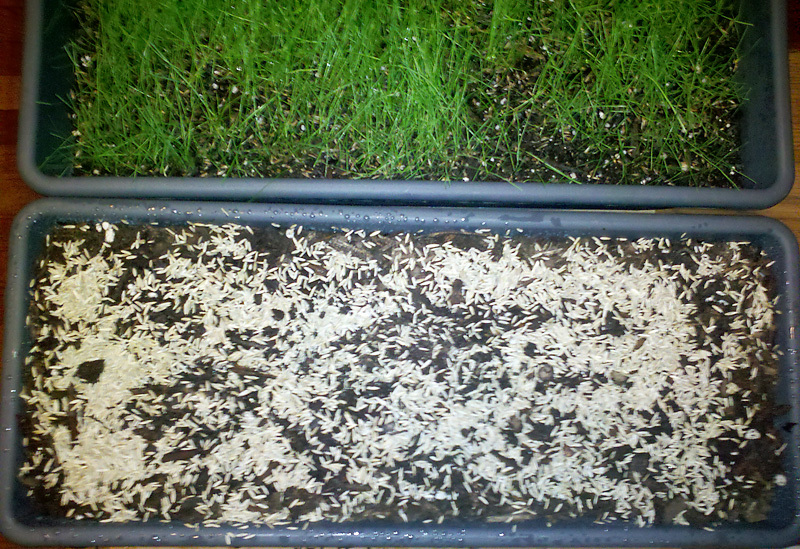 Mixed the seed by hand to spread it out and get good seed to soil contact. I'm going to check in a little bit and possibly cover with a little more potting mix if there's enough room. 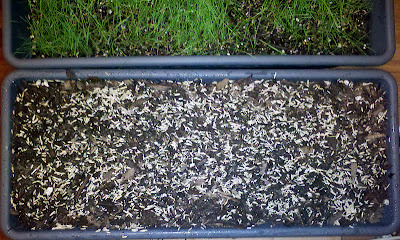 I didn't do that the last time and saw plenty of seeds germinate that were just sitting on top of the potting mix. Covered with coffee filters and added about a cup of water. Will be watering with a spray bottle 2-3 times throughout the day until seeds germinate at which point I'll carefully remove the coffee filters (seeds sometimes stick to them). These planters are near a North facing window so they get some indirect sun throughout the day. I've occasionally moved the top planter to a south facing window so it can get some more direct sun. 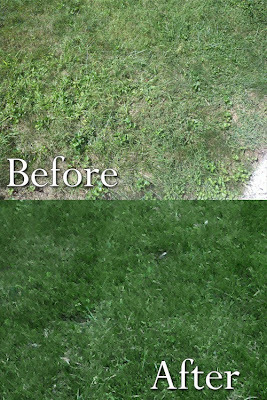 Update: I was happy with the results of my test of Black Beauty grass seed and decided to use it for my organic lawn renovation. Check out the results. Thanks, for letting me know. 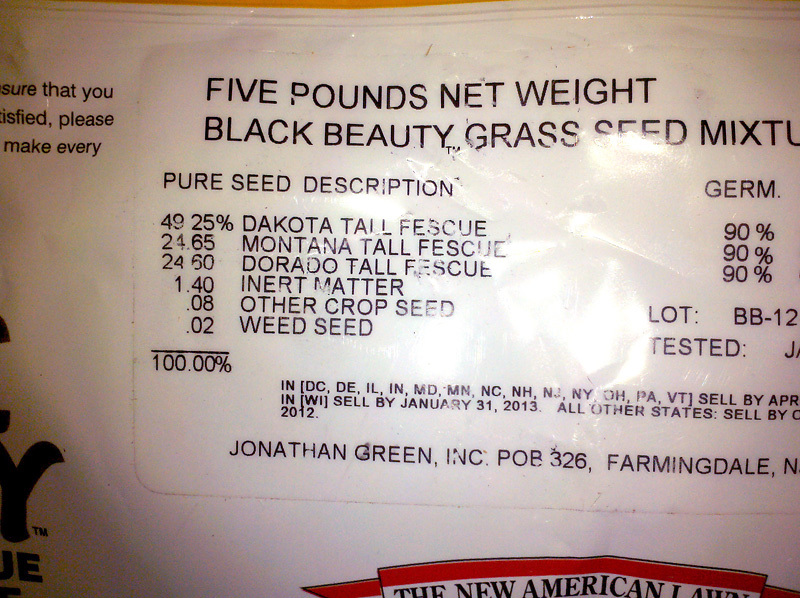 I'll be using Black Beauty as well since I couldn't make a decision on other seeds and I already have the Black Beauty. The little test I did came out looking nice and I keep hearing good things about it. Once you seeded your lawn with the original Black Beauty seed, how long before you notice it started germinating with new seedlings coming up? Thanks for sharing your experience with it. When I put it in the lawn it was about 10 days. 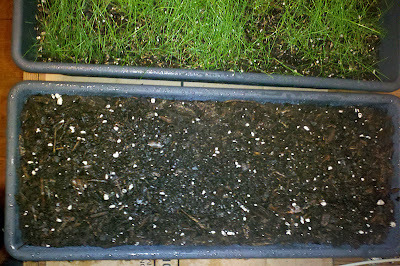 It was already starting to get cold when I seeded. 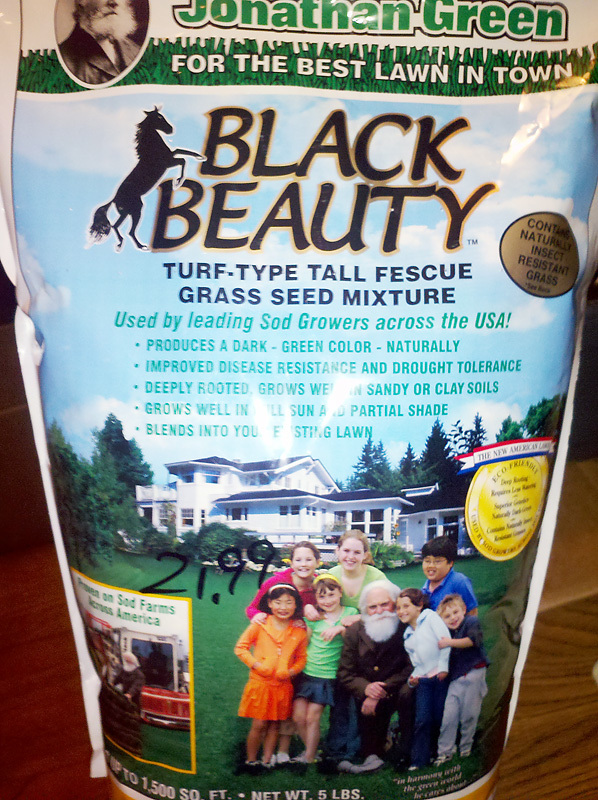 Once you've planted the Black Beauty seeds in your lawn how often did you water it per day, per week? Re: the "waxy coating". Does anyone know if this is injurious to cats and dogs who might ingest it? On a related subject: the seeds "retain water" according to promos for this seed. If birds ingest some of the seed before it sprouts, will this property (of the seeds to retain water) be injurious to the birds? My cat eats the grass from time to time and hasn't had any issues. Regarding the retaining water bit.... I haven't seen Black beauty with that feature. Other seeds that I've seen with it I'm pretty sure it's mainly made of paper with some fertilizer mixed in. One of the benefits is that birds won't eat it if I remember correctly. Any way, to be on the safe side you should probably call Jonathan Green and ask them directly. Jonathan Green's Tall Fescues as well as others such as Kentucky 31 have endophytes. Endophytes are naturally occurring fungus that actually make the grass insect repellent. Good news for the grass but bad for grazing animals who eat the grass. Kentucky 31 was once a popular pasture grass until it was discovered that it created health problems for even large livestock. I don't know how much would have to be ingested to cause significant harm but I wouldn't encourage it to be safe.